Parker, T. H. (along with S. Nakagawa, J. Gurevitch, and others). 2016. multiple editorials advocating adoption of transparency standards: Ecology Letters: doi:10.1111/ele.12610; Conservation Biology: doi:10.1111/cobi.12760; Systematic Botany: doi: 10.1600/036364416X692262, Auk: doi: 10.1642/AUK-16-122.1, and more to come. Parker, T. H. 1999. 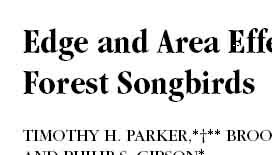 Responses of Bell’s Vireos to brood parasitism by the Brown-headed Cowbird in Kansas. Wilson Bulletin 111: 499-504.